Commissioning the design and the construction of a one off house can be one of the most daunting and rewarding projects ever undertaken in a life time. 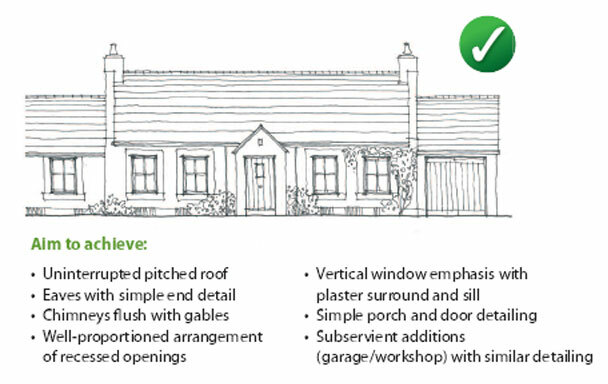 This house design guide sets out to explain and illustrate on a step by step basis all the various elements that need to be considered, outlining aspects of good design, siting and detail. 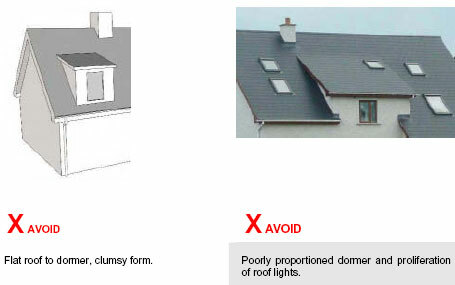 This guide should be used in conjunction with advice from the architect atDeclan Noonan & Associates. A rural dwelling is a house built on unzoned land situated outside the identified development boundaries of a town or village. Development of a one off house in the country side is required to comply with the guidelines for Rural Settlement in the appropriate County Development Plan. 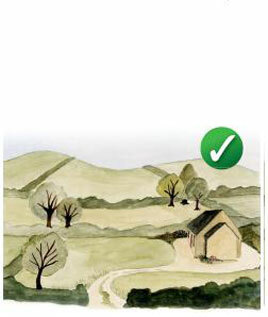 This sets out the criteria governing whether an applicant has a rural housing need or not. The architect and team at Declan Noonan & Associates can advise you on this policy and whether or not your idea will meet the criteria set out in the Development Plan. 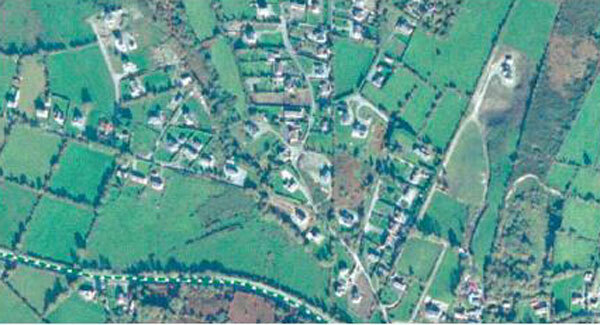 The minimum site size required for a single dwelling is determined by the need to meet the minimum separation distances between the treatment system, the percolation area/polishing filter, the proposed house, any watercourse, lake, wells, neighbouring dwellings, site boundaries and roads. The availability of a public water main/group scheme may assist in reducing the overall required site size. 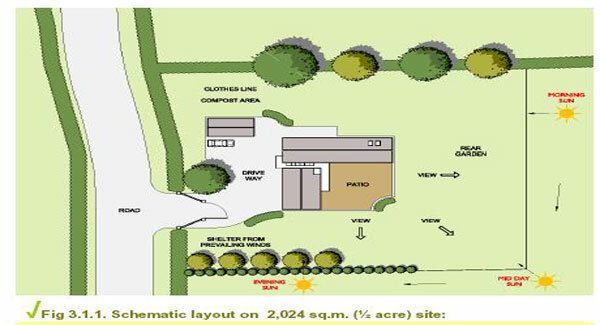 In general a minimum of 0.5acres (2,024m²) is normally adequate however this may not always be sufficient to meet all minimum separation distances based on the permeability of the soil , the proposed site layout, its configuration or shape and the proposed occupancy of the house (p.e., population equivalent). The plan size of the percolation area/polishing filter will be determined by the permeability of the in-situ soil on the site and the maximum potential occupancy of the house. If an extension to an existing dwelling is proposed with a resulting increase in the maximum potential occupancy of the completed dwelling then the percolation area/polishing filter may have to be increased in size/plan area to cater for the increased loading. The capability and capacity of the existing septic tank or treatment system along with the associated percolation areas will need to be demonstrated to the satisfaction of the local Authority to determine whether they can cope with the increased maximum potential occupancy. 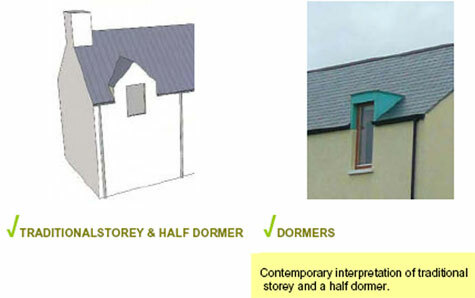 This must be addressed in any planning application submission. For the purposes of sizing a polishing filter the minimum area of a single bedroom is 6.5m² and that of a double bedroom is 10.2m². In general a single room = 1 p.e. and a double or twin room = 2 p.e. If the site being considered is not served by a public sewer then waste water will need to be treated and disposed of on site (i.e. be treated in a treatment system before discharge to a percolation area/polishing filter with final discharge through the subsoil to groundwater). A full site assessment will need to be carried out in order to determine the suitability of the site to treat and dispose of wastewater from the dwelling. 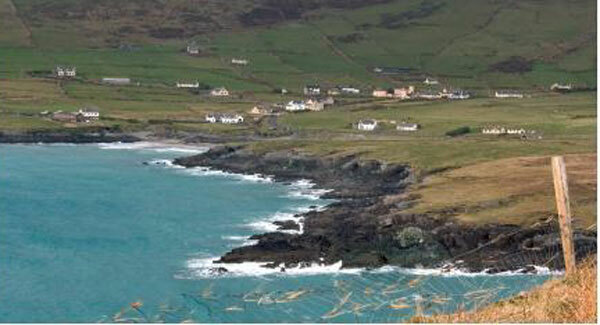 Declan Noonan & Associates have vast experience in carrying out these assessments. The testing procedure will be carried out by a Chartered Environmentalist who has also completed the FAS/FETAC “Site Suitability On-site Wastewater Treatment” Certificate. We carry full Professional Indemnity Insurance as required by the County Council. We provide the Site Assessment service as a stand alone service. If you are using another architect or engineer who is not on the approved panel we will be more than happy to work in conjunction with your architect or engineer to provide you with a Site Assessment. 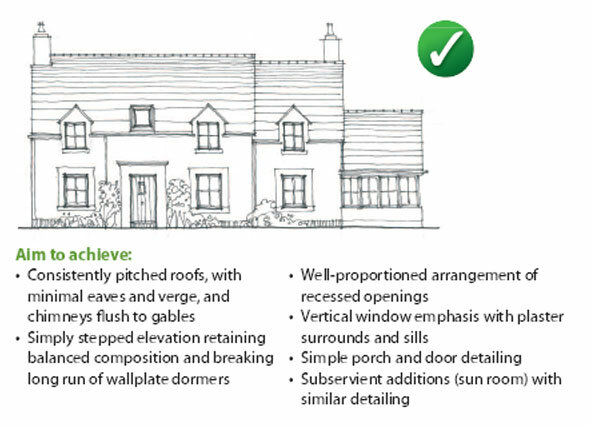 We promise to make every effort to ensure your planning application is successful. Click here for more information on our Site Suitability Assessment service. An initial site assessment should be carried out on the undisturbed in-situ soil on the proposed site and no site remediation/improvement works should be carried out without the benefit of planning permission. Where site remediation/improvement works are required and have been approved by the planning authority a further site assessment will need to be carried once the improvement works have been completed (this will be contained in a condition of grant). For more information relating to on site wastewater treatment systems please contact Declan Noonan & Associates. In order to ensure safe access and exit to a dwelling site minimum clear and unobstructed lines of vision are required. Sight distances and stopping sight distances should be in compliance with current road geometry standards as outlined in the NRA document Design Manual for Roads and Bridges (DMRB), specifically Sections TD 41/95 and TD 9/07. Click here for more information on Sight Lines. Contact Declan Noonan & Associates and our architect will give you an accurate appraisal and advice on all aspect of your planning application. Before you focus on the type of house you wish to build and decide on the site you wish to build on, you must first have an understanding of the landscape. 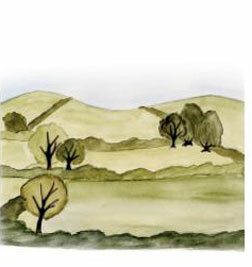 Analyse the character, value and sensitivity of the landscape you wish to build on. this should involve an analysis of any impact the house may have on the landscape, not just in terms of its visual impact but also practical and economic considerations such as services; water, electricity, telephone and proximity to schools, shops and other public conveniences. For example, rural landscpae could fall into one of these categories. Each landscape area will require a different response to the local characteristics and settlement patterns so as to integrate new development. These landscape areas are mainly characterised by low-lying undulating farmland where naturally occurring vegetation exists. 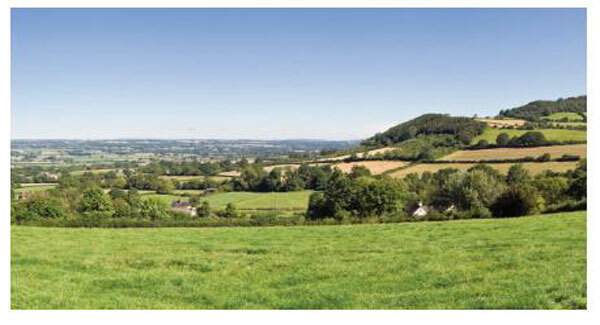 This vegetation offers great opportunities to enhance the location and choice of dwelling in the countryside. 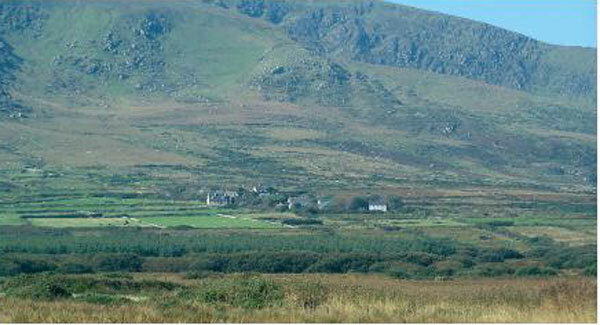 In some lowland areas however vegetation can be quite sparse and houses are often visible from a wide area. This should be considered when choosing a location in which to build, as house choice will be limited and additional landscaping required. Informal development patterns reflective of traditional farm holdings assimilate best into lowland farmland areas. 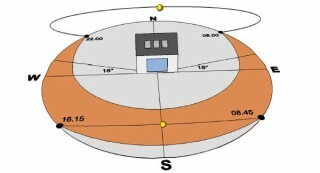 Locating a dwelling house in these areas is best achieved by utilising the natural contours of the land. the natural screening that exists will integrate the dwelling into the landscape and shelter the dwelling from harsh weather conditions thereby minimising heating costs and providing natural privacy for the home owner. Photo of lowland area with sparse vegetation where dwellings can be difficult to integrate and are often visible from a wide area. These landscape areas are often characterised by open and exposed hillside and mountainous terrain usually consisting of areas of high amenity value. Maintaining the natural beauty of such areas is of critical importance in deciding upon the location and design of new buildings. the traditional settlement patterns in these areas consisted of informal compact cluster type settlements incorporating simple architecture particular to the region, which is referred to as ‘vernacular architecture’. Vernacular architecture is a term used to describe methods of construction which use locally available materials and traditions to address local needs. Vernacular architecture tends to evolve over time to reflect the environmental, cultural and historical context in which it exists. Future development in these landscapes is best achieved by locating development reflective of the traditional vernacular style within or directly adjacent to such settlements in an informal fashion. Our architect here at Declan Noonan & Associates has built up a wealth of experience and knowledge in successfully integrating developments into sensitive landscapes. 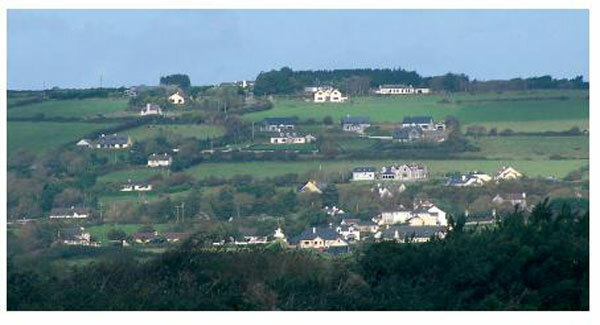 Exposed mountainous area- informal compact cluster type settlement thus maintaining the rural character of the area. These landscape areas are characterised by their proximity to nearby urban settlements. The rapid urbanisation of the countryside is very evident in these areas due to development pressure from the nearby urban areas. The ability of this landscape to absorb future development is quite limited due to the threat of water pollution, loss of rural character and impact on the capacity of the road network. The use of urban designs and ribbon type patterns of development should be avoided in these areas. Ribbon type patterns of development on the edge of a town. These landscape areas are quite varied from dramatic cliffs tops to sandy beaches and from undulating sand dunes to flat coastal plains. They are all characterised by very open and exposed lands with little or no vegetation. It can be very difficult to integrate, shelter and consequently heat a dwelling in this type of landscape. Coastal areas are particularly vulnerable to intrusive development. 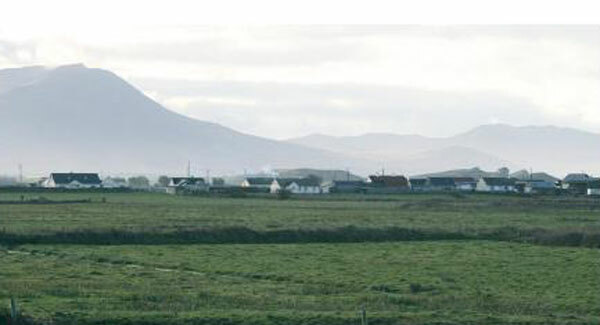 Development in coastal locations is best achieved through locating development adjacent to existing settlements and through the use of vernacular architecture or contemporary interpretation of vernacular architecture which is reflective of the rugged exposed environment. Scattered housing development on open exposed coastal landscape. 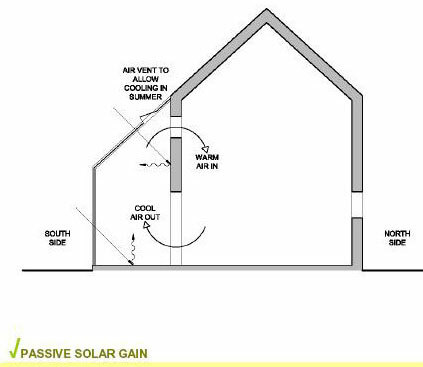 The orientation of the house and sizing of windows in relation to the path of the sun can provide significant benefits in relation to passive solar gain. 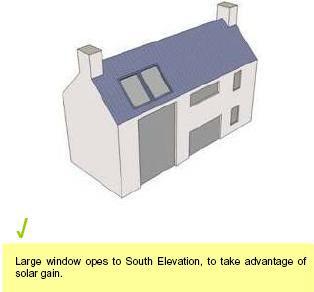 Orientating a house within 15 degrees of due South can achieve energy savings of up to 30%. In orientating the house existing features of the surrounding landscape should be taken in to account such as trees, hedgerows and natural land forms which will buffer the house against harsher weather and prevailing winds. 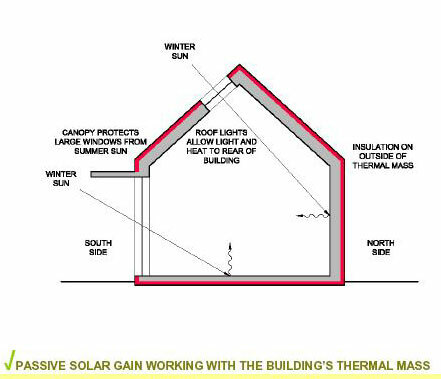 Existing features such as deciduous trees on the sunny side will help to shade the house from excess heat during the summer months, but allow the lower winter sun to reach the house provide free solar heat gain. 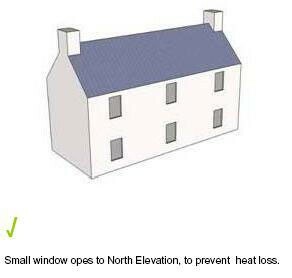 Orientating a house within 15 degrees of due South can achieve energy savings of up to 30%. Creating large glazed South facing elements which can be designed to assist with and regulate passive solar gain. Warm and cool air circulating by convection. 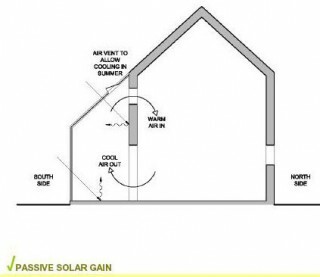 The above illustrates the principals associated with passive solar gain. Large South facing windows and roof lights capture heat from the sun which is absorbed and stored in the building fabric, referred to as the building’s thermal mass. The heat stored in the building fabric during the day radiates back into the rooms at night time. Our Passive House Design accredited architect knows all the tricks of the trade to get the best out of your site and design your dream home to take advantage of all the attributes of your site. 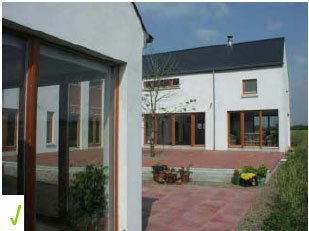 Contact the architect at Declan Noonan & Associates and find out more about passive house design. Siting a dwelling house on low-lying lands embracing the contours and folds of the land will allow for successful integration of the dwelling into the landscape. Take note of how visible the site is from the surrounding area; The less visible the site – the more integration will be achieved – the greater likelihood of obtaining planning permission. 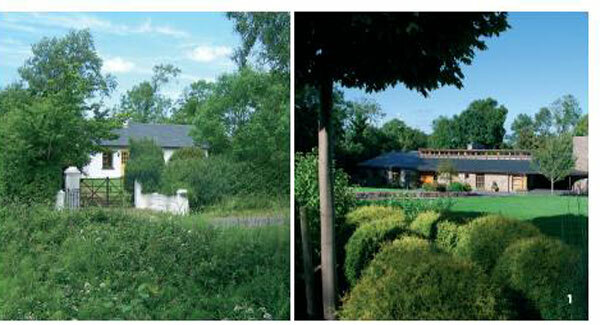 Low-lying lands will also provide natural shelter and privacy for the dwelling and its curtilage, reduce heat loss and allow for greater house design choice. the occupants of a dwelling in such a location can also feel content in the knowledge that they are maintaining the rural character of the area for future generations to enjoy. The dwellings have utilised the natural contours of the land and natural screening to integrate into the rural landscape. 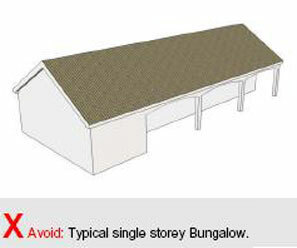 Avoid exposed sites which lack shelter. 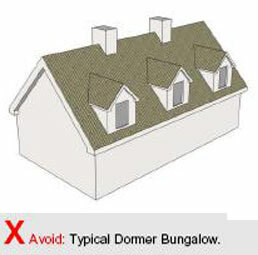 Avoid: Building in backlands behind existing dwellings, development of this type can compromise the private residential amenity of existing and established dwellings. 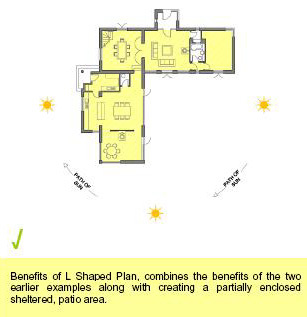 Split level plan responding to the contour of the site. Avoid: Large cut into landscape and large landfill platform to the front. An analysis of the existing site boundaries is also a very important element to consider in the selection of a site and can affect how well your dwelling house will integrate into the surrounding rural area. 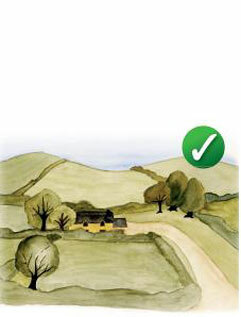 In particular the removal of roadside boundaries to facilitate a vehicular entrance and the construction of a new roadside boundary at a setback position can have a significant adverse impact on the rural character of an area and it can significantly increase the visual impact of your dwelling house on the rural landscape. In the past there has been a wide choice of materials allowed to construct the front boundary fence, including timber fencing with hedging, concrete block, stone and sod and stone. the choice permitted, range in styles and quality available has however lead to confusion as to what is the most appropriate treatment for a new front boundary fence. In some cases the treatment of new boundaries and entrances appears particularly insensitive and suburban with the use of crazy paving type stone cladding instead of dry stonewalls, elaborate gate posts and gates and the planting of non- indigenous hedge species. One of the best ways to successfully integrate your new dwelling into the landscape is to retain existing field boundaries and in particular the front boundary ditch, hedge or stone walls. The retention of the front ditch, if properly maintained, is more cost effective than any alternative boundary treatment. Where existing, the front boundary ditch, hedge or stone walls should be retained and only removed in part to facilitate the construction of a new vehicular entrance or to provide adequate sight lines. Click here for more information on Sight Lines. In certain cases, where part of the ditch, hedge or stone wall needs to be removed to facilitate adequate sight lines, it should always be re-positioned and reinstated on site at the appropriate set back position. This can be done very effectively and it maintains the rural character of an area. 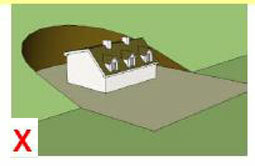 The existing ditch, hedge or stone wall should be strengthened or repaired where required. 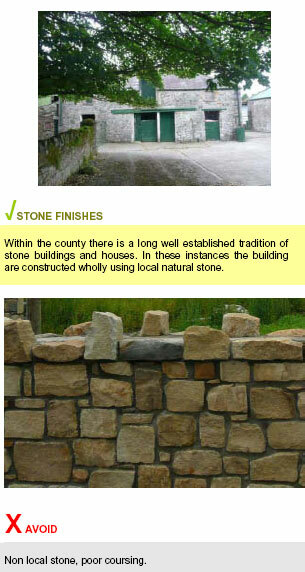 Wing walls should be constructed in sod and stone or natural stone only. The type of materials to be used for the construction of lateral boundaries should also be considered at an early stage. 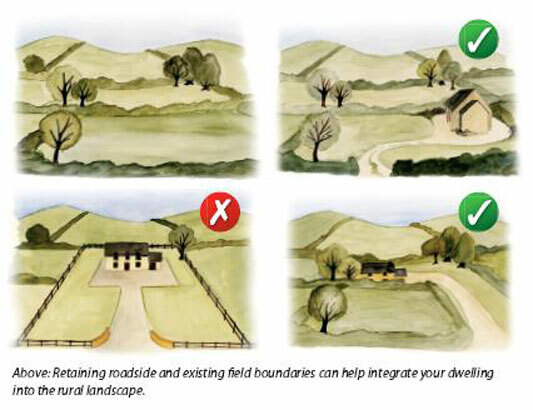 Where existing, field boundaries should be retained. If it is necessary to construct new lateral boundaries, always match the materials used on the front roadside boundary. The use of ranch style timber post and fencing and the planting of non-indigenous hedging and the construction of masonry blockwalls should always be avoided in a rural setting. The location of the vehicular entrance, driveway and associated car-parking areas should be sensitively and discretely sited using existing contours to avoid scarring of the landscape. A formal rigid pattern, where the driveway dissects the site midway with an expanse of car-parking to the front of the house should be avoided. • The location of the entrance and driveway should be off set from the location of the dwelling, typically sited at either side of the site (assuming suitable sight distances), thereby retaining roadside boundary in front of the dwelling and achieving further integration of the dwelling. 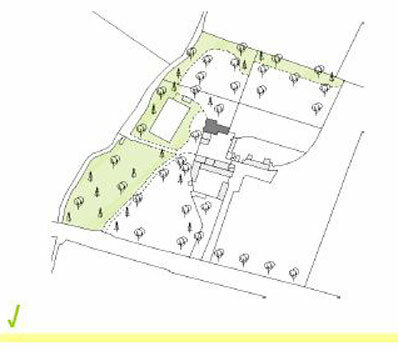 •The driveway should follow an informal route from the entrance into the site along one side, towards the rear of the dwelling, using existing contours of the site where possible. 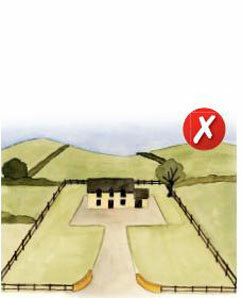 • The main car-parking area should be located to the rear of the dwelling or away from view of the public road. • The extensive use of hard surface areas should be avoided and gravel finishes should be considered on suitably graded driveways instead. Examples of inappropriate treatment of roadside boundary. Achieving a suitable design of a house for a particular site requires a significant amount of skill in order to get the form, scale and proportions right. 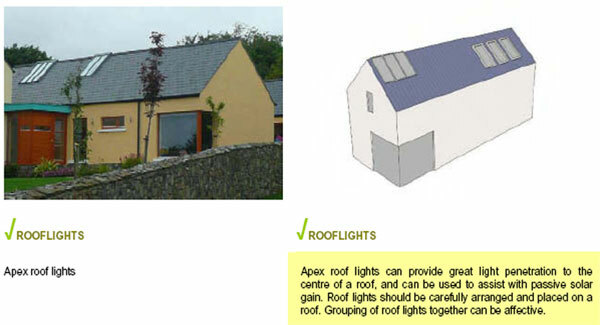 Declan Noonan & Associates are suitably qualified and experienced in designing new builds. We can work with you and your ideas to achieve a successful design for your particular site. Click here for more information on our design service. 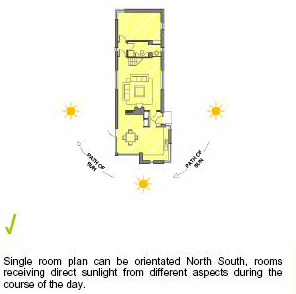 • Climatic conditions of the area in terms of orientation, layout and design detailing. 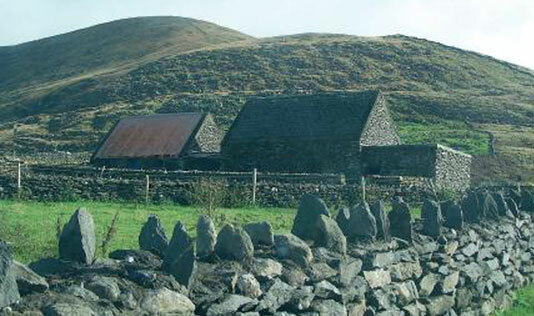 Study the character and physical attributes of the landscape and the form of traditional buildings in the area. 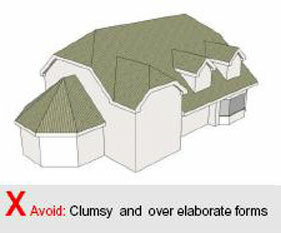 The landscape character features should be retained and used to influence the design of the house. 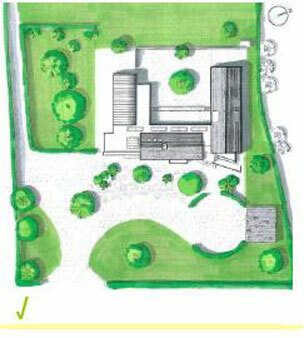 Consider whether your proposal will be compatible with the surrounding landscape and existing buildings. Anyone considering building a new home should note that if the correct location and siting is not achieved, a well designed building accompanied by ambitious landscaping proposals, is unlikely to be successful. The key to successful design is to design your dwelling to suit your site. Don’t just copy a neighbours or friends design as it may not be suitable for your site, or in the long term may not really suit your own needs. In addition there are many examples of inappropriate house design in the rural area which we feel should not be replicated. 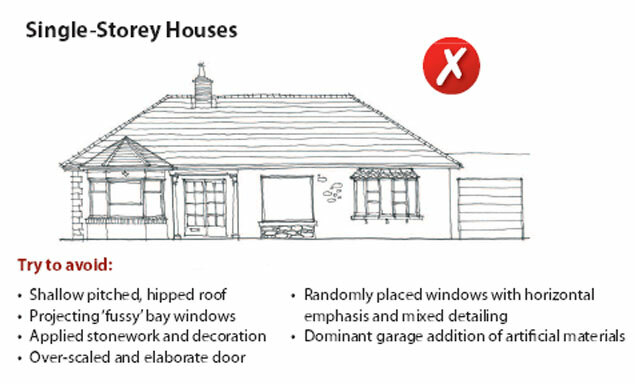 In the assessment of planning applications by the local planning authority, the same design issue – that of repetitive house designs on unsuitable sites arises again and again. This results in requests for amended drawings to be prepared causing significant delays and increased cost for the applicant. This can be avoided when greater attention is given to selecting the most suitable site, designing the dwelling to suit the application site and not trying to retro fit a certain house design seen elsewhere into your site. The key thing to remember when designing your house is – Keep it simple. Simplicity is the key. Such an approach will stand the test of time. A simple and robust design is something that has in the past worked and will continue to work well for generations to come. Fussy and complicated detailing should be avoided in order to achieve a successful planning application and avoid a ‘clumsy’looking design. A simple design does not mean that you will be prevented from individualising your dwelling, or designing your house to suit your lifestyle. A contemporary interpretation of the traditional design is encouraged on suitable sites at appropriate locations. Successful contemporary designs generally reflect the best principles of traditional vernacular architecture. For example, the Barn House – is a typical vernacular structure that can integrate successfully into the rural countryside. This structure provides numerous opportunities for renovation and contemporary extension thereto for habitation purposes and can also provide inspiration for new build in the rural environment. 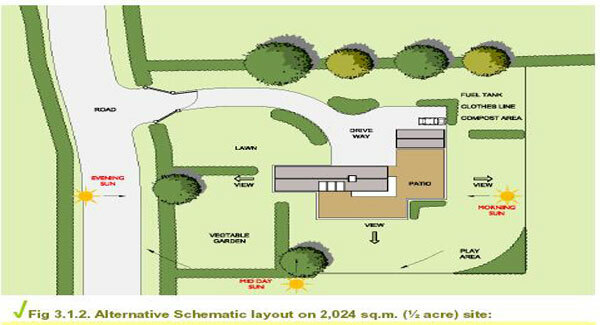 It is necessary when designing a house to assess and study the type of landscape the site is located in and the location of the house within the site. 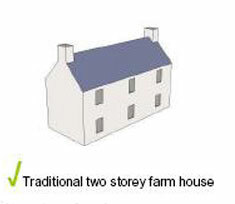 A different scale of dwelling house will be appropriate for differing type of landscapes. The traditional estate house provides a good example of how a large house can be successfully assimilated into a particular landscape. Mature screening prevailed, dwelling was set back substantially from the adjoining roadway and located amongst natural screening, roadside and field boundaries were retained. In particular, field boundaries, existing natural screening, topography and vernacular architecture in the area will all play a role in determining the appropriate scale of dwelling for the site. 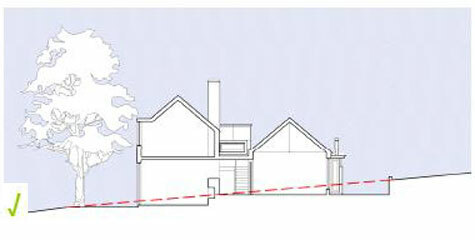 The scale and height of the single storey dwellings relate successfully to the landscape. The two storey dwelling fails to integrate into this type of landscape. 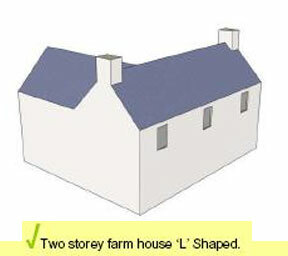 • The size of the dwelling should relate to the size of the site. 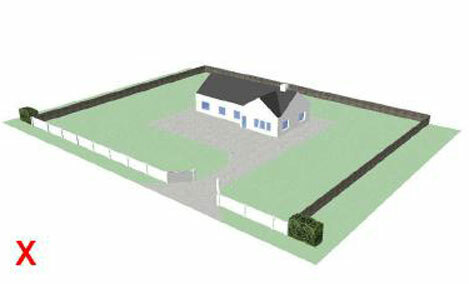 A larger dwelling house will require a larger site with extensive screening. • Utilize the natural contours and folds of the land to assimilate the dwelling into the landscape and act as a backdrop. 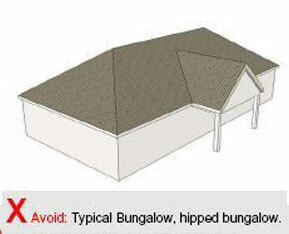 • Take note of existing house type in the area. 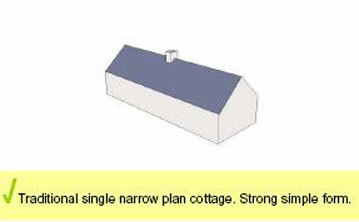 Where mainly single storey type dwellings dominate, opt for similar scale. A large house beside a small house can look out of place and can have a negative impact on the privacy and light of the smaller dwelling. • Utilize existing natural screening on site. 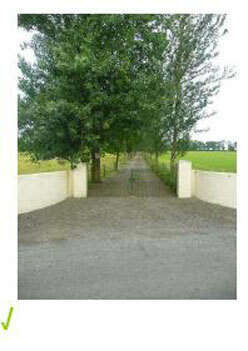 Mature trees will provide an appropriate setting for a higher scale dwelling. • More low-lying lands should be opted for in site selection. 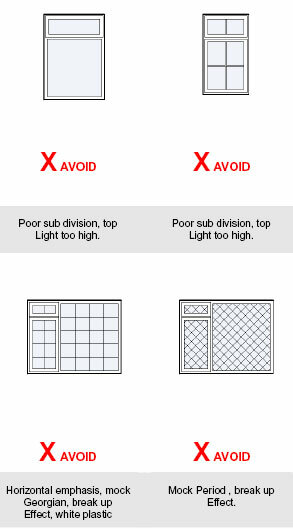 Avoid breaking the skyline and elevated exposed locations. 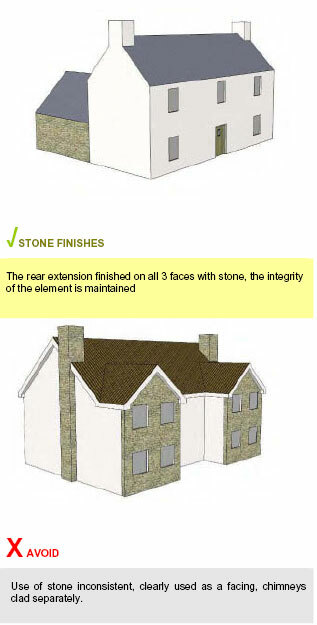 • Employing a narrow plan form with suitable massing will reduce the bulk and height. Generally the size of window and door opes are determined by block and brick sizes. The width and height of the ope can be set out using these sizes and applying the proportioning system described earlier. 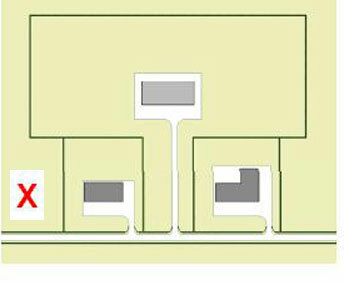 The above example of a 900mm wide x 1450mm high ope which matches the proportions of the golden section allow for standard block sizes. The golden section outlines a proportion ratio of 1 to 1.618. Simple rule check, arc to fall within top quarter of the ope. Storey and half conservatory attached and integrated with building form. 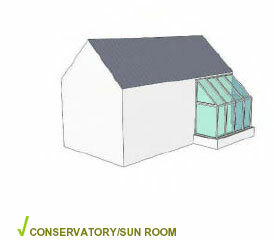 Corner glazing incorporated within the overall form to the south element of the building to create a sun trap/sun room. 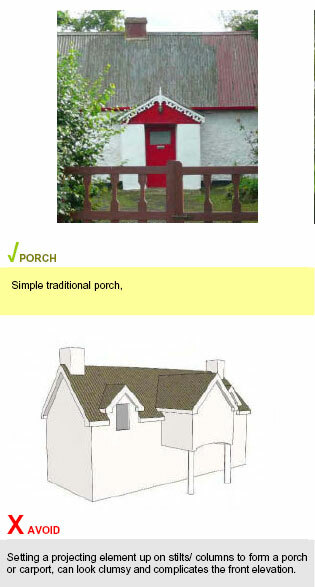 This section focuses in a more detailed way on design issues associated with many houses types proposed in rural settings. It highlights the most recurrent inappropriate design elements appearing in planning applications and offers suitable alternatives for consideration. It should be noted that these elements may be inappropriate in certain cases. Some contemporary designs may allow for the limited use of some of these elements in the production of an appropriate design to suit a particular site and location. With the increasing cost of energy and issues of sustainability at the top of the agenda, energy efficiency and environmental sustainability should also be considered at the initial design stage. Declan Noonan & Associates have a Chartered Environmentalist on our team. To find out more about our energy management services click here. • Take into account the sun-path, discuss this issue with your architect. 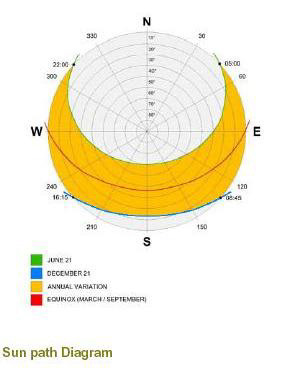 A site with a north-south orientation is best in terms of the potential to maximize daylight and solar gain. 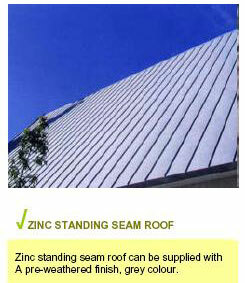 • A compact building form of minimum surface-to-volume ratio is best for reducing heat loss. 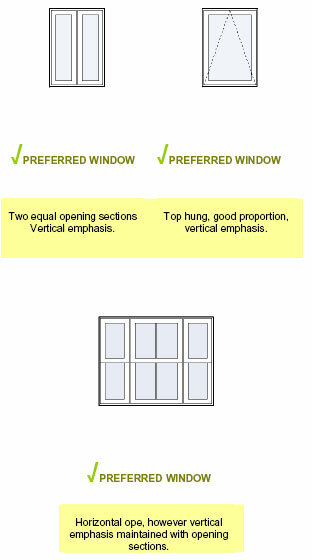 • Keep window openings on the north elevation to a minimum. larger openings should be kept for the south elevation. 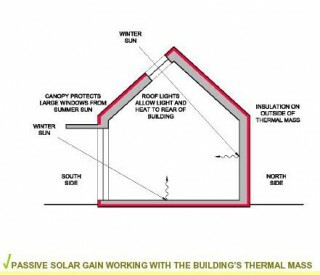 • A rectangular building with one of the longer facades facing south can allow for increased passive solar heating, day lighting and natural ventilation. 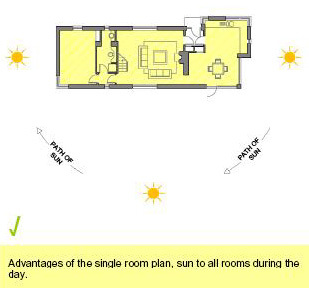 As well as reducing energy costs, sunny south facing rooms have a higher amenity value. 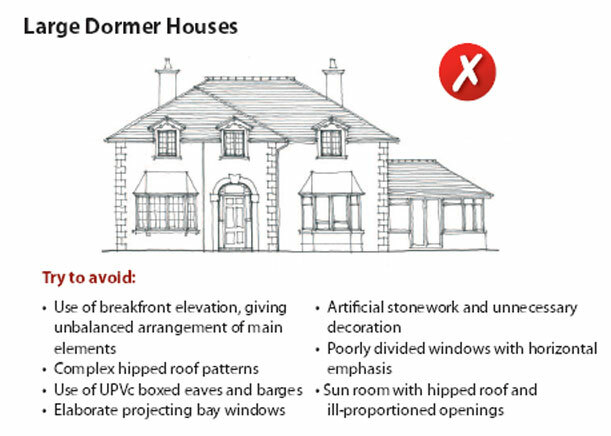 • Projections such as bay and dormer windows should be kept to a minimum since by increasing the surface to volume ratio of the building they will increase heat loss. In addition it can be more difficult to insulate these types of projections. 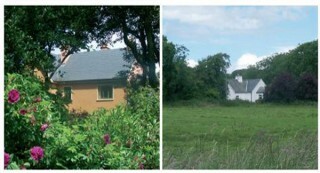 • Consider renovation/repair of existing structures in the rural countryside before considering a new build. 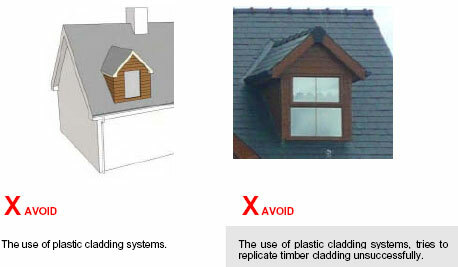 • Any demolition materials should be reused on site where appropriate. A Building Energy Rating (BER) Certificate is an indication of the energy performance of a home. The BER certificate is accompanied by an Advisory Report which identifies how you might improve the energy performance of your home. It covers energy use for space heating, water heating, ventilation and lighting calculated on the basis of standard occupancy. A Building Energy Rating (BER) i ssimilar to the energy label for a household electrical applianc e like your fridge. The label has a scale of A to G. A-rated homes are the most energy efficient and will tend to have the lowest energy bills. Declan Noonan & Associates are registered BER Assessors. Click here for more information on our BER assessment. It is often assumed that a grant of Planning Permission also means that you have complied with the Building Regulations. This is not the case! 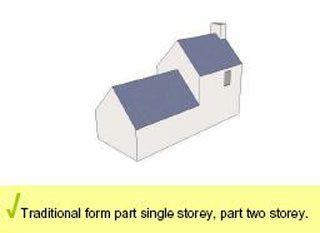 Later attempts to achieve compliance may compromise your original planning permission and be very expensive to rectify. The building regulations should be fully considered at the pre-planning design stage and will result in a warmer, dryer, safer, more accessible and more valuable house in the future. Declan Noonan & Associates can advise you on all matters relating to Building Regulations. Click here for more information. This guide is intended to help those who are thinking of building a new home. For advice or further information please feel free to contact Declan Noonan & Associates. We are the one stop shop for all your design, engineering and construction needs.